Amazon.com on Tuesday said it was raising the minimum wage it pays all U.S. workers to $15 an hour, a move that comes as the company faced increased criticism about pay and benefits for its warehouse workers. Here is the cynical view of this: Amazon likely is being pressured by the tightening labor market to raise wages anyway. But its call for a general $15 minimum wage is strategically brilliant. The largest employers of labor below $15 are Amazon's retail competitors. If Amazon is successful in getting a $15 minimum wage passed, all retailers will see their costs rise but Amazon's competition will be hit much harder. 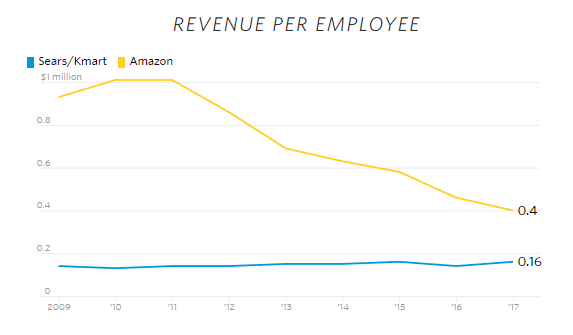 The reason is that due to its internet sales model, Amazon's revenue per employee is MUCH higher than for most retailers -- you can see this in the chart above in a comparison to Sears. If we had data on revenues per employee in small retail, the numbers would be even lower. So a minimum wage increase raises costs to Amazon's competitors by a much larger percentage of revenue than it does for Amazon. In short, Amazon's cost advantage over bricks and mortar retailers would be enhanced by a $15 minimum wage.